There are two predominant ways through which research promotes our awareness of the value and necessity of knowledge. They are: the never-ending expansion of the frontiers of the world we experience, and the creation of foundations for educational needs of the society. The same two objectives lay at the roots of the 'SAVAP International' which, being a civil society organization is determined to ensure that all activities it pursues meet the highest standards. Recognizing the great significant power of a competent and efficient publishing policy, the SAVAP International has embarked on the launching of a journal addressed to the whole academia and researchers' community, in a belief that it will be of particular interest to young researchers at the beginning of their path as well as all those who are interested in humanities, social science, management sciences, natural and applied sciences, their achievements and prospects. Our main aim is to provide information on discoveries and phenomena that determine the rhythm of life in Asia and other regions of the globe. The times we are now living in abound in important events and transformations that will be surely influencing the directions of global future development. Here again, the responsibility of academicians and researchers is to shape and promote attitudes for which the truth and human well-being are a primary value. I hope that 'Academic Research International' will be well received by the research and academic community. I also believe that it will make an essential contribution to the popularization of research in world for peaceful globe. "SAVAP International" is an organization of visionary academicians and researchers, registered under societies registration act 1860. The purpose of the organization is to support research activities for advancement of knowledge in asia and other regions of the world. 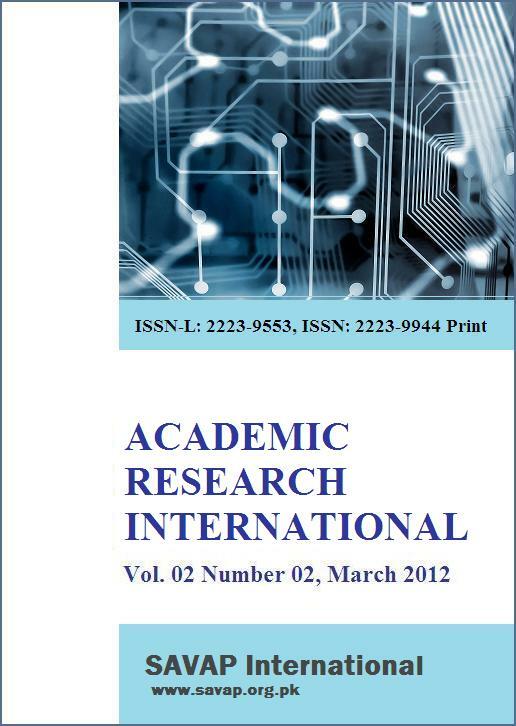 Academic Research International (ARInt.) is an international, professional, peer reviewed journal. It is regularly published bimonthly in English by SAVAP International. It is a scholarly journal of opinion and research in academic research. Its mission is to provide an interdisciplinary forum for discussion and debate about academicians researches most vital issues. It covers a wide range of topics of current concern in academicians' research in humanities, social sciences, managment sciences, natural and applied sciences. Each issue contains a variety of articles, essays, and book reviews. We are interested in receiving well-written and timely papers from individuals for possible publication. The focus of the publication is original completed research that has application to academicians, researchers, policymakers, administrators, and teachers within the broad areas of academic research. We invite you to conduct research activities and send to our journals " Academic Research International" , and " educational Research International". We believe it will give support to achieve the goal of peaceful globe. Copyright © 2011-2016 Academic Research International, SAVAP International. All right reserved.